An allergy is an overcompensation of the body’s immune system when confronted with the protein of a food, a drug (such as penicillin), a bee sting or an airborne pollen that the body views as an invader. The body releases an overload of histamines in response to the attacker substance, which can create symptoms such as a runny nose, itchy eyes, hives, general swelling, vomiting, diarrhea, trouble breathing, quickened heart rate and finally loss of consciousness because of a drop in the person’s blood pressure. This is calledanaphylaxis. Some people might misuse the term, “allergy” in an attempt to explain their intolerance of a food or drug. Lactose intolerant children may not be able to drink milk without extreme gastrointestinal upset, however this differs from an allergy. 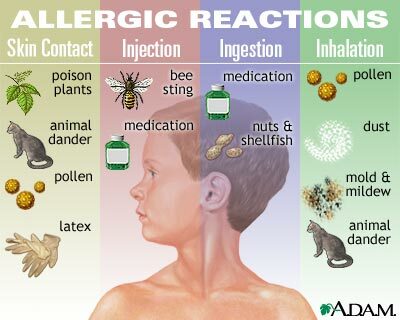 An allergic reaction would have the various symptoms listed above in addition to the upset stomach. A natural aversion to a food might signal an allergy. My son’s grandmother has been “peanut averse” all her life. She has never been tested for a peanut allergy, but very likely has some kind of allergy. The only way to determine if your child has an allergy is to have an allergy testing completed in a physician’s office. Most primary care physicians will refer you to an allergy specialist if your child is exhibiting severe allergic symptoms. 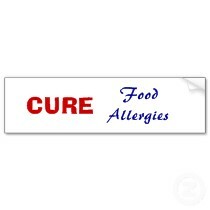 Many children get diagnosed with food allergies by their pediatrician, and for some families that’s as far as they go. The pediatrician orders allergy blood testing and does his/her best to determine what the child is truly allergic to. I have heard some of the most amazing stories from food allergic families about what they heard their pediatrician tell them in regard to food allergies. Possibly the parents aren’t hearing the information correctly, or possibly the doctor isn’t relaying proper medical advice for food allergies. 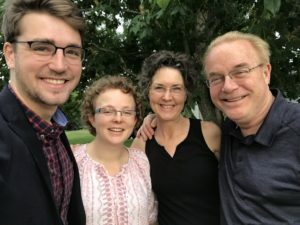 We were lucky – our pediatrician sent us to see a board certified allergist when Morgan was about 15 months old and had already had a contact reaction to peanuts and a reaction to his MMR shot. At that point, the pediatrician said, “your son has more allergies than my expertise can properly address. You need a specialist.” I am so grateful for that. We’ve learned the value of a pediatric allergist who sees hundreds of patients every week just like Morgan. 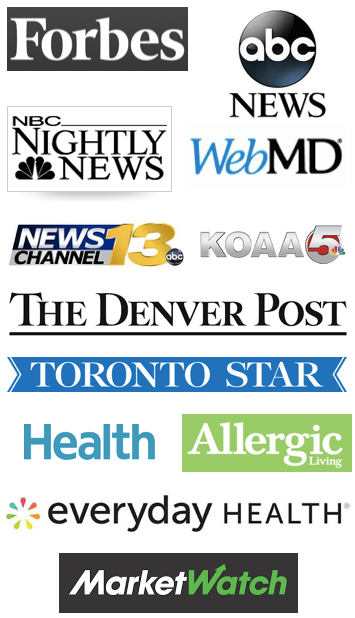 So what is a Board Certified Allergist/Immunologist? He/she is a physician who has fulfilled the requirements of and has received certification as a diplomate of the American Board of Internal Medicine (ABIM) and/or the American Board of Pediatrics (ABP) followed by additional certification by the American Board of Allergy and Immunology (ABAI), a conjoint board of the American Board of Internal Medicine and the American Board of Pediatrics. The purpose of certification by the ABAI is to provide assurance to the public and the medical profession that a certified allergist/immunologist has successfully completed an accredited educational program and an evaluation process, including a secure, proctored examination. ABAI certification also assures that the physician possesses the knowledge, skills, and experience requisite to the provision of high-quality patient care in allergy and immunology. The ABAI believes that all allergists/immunologists should have a fundamental knowledge of the biological science basic to this discipline, and that ABAI is responsible for the establishment and maintenance of the standards of knowledge required for certification. 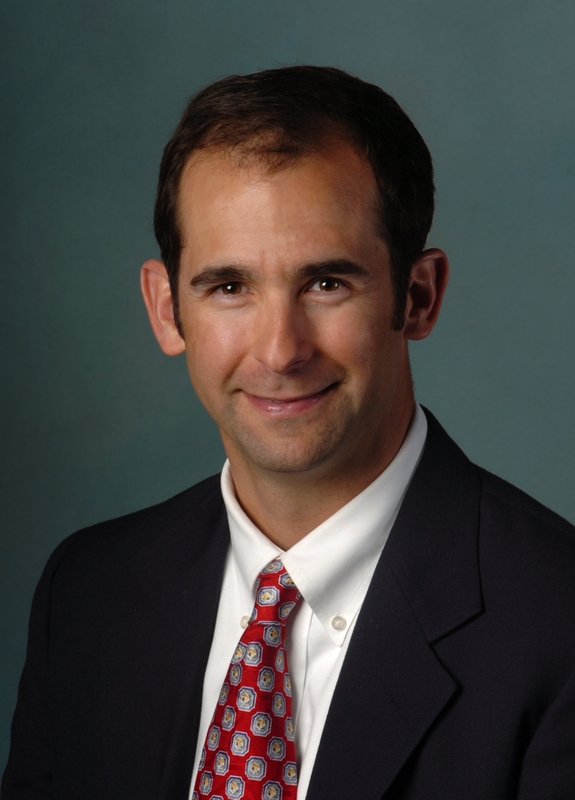 A Board Certified Allergist spends two to three years in “fellowship” training. This occurs after a residency in either Internal Medicine or Pediatrics (or rarely a combined residency for Internal Medicine AND Pediatrics). The order of education is as follows: four years of college, four years of medical school, then three or four years of residency training, then 2 or 3 years of fellowship – And that is the “short path”. So, a Board Certified Allergist has completed all of that training and taken exams – “board exams” to show that they did more than just show up at work every day, but actually studied and learned while they were there. After training is completed and several years into one’s career there is an opportunity to become a “Fellow” of the national allergy organizations. This is an honorary designation and generally has nothing to do with extra training and there is no test to complete to become a “Fellow of the American College of Asthma Allergy and Immunology (ACAAI). The designation of fellow should not be an issue of great concern while “shopping” for your allergist. However, the designation of board certification is very important. It may be worthwhile to find out if the doctor trained in Pediatric or Adult medicine and allergy. Usually when you take your child to the doctor you will know (follow your instincts) if they trained with kids or adults. Not all that wheezes is asthma. Not all that drips is allergic rhinitis (hay fever). Not all people with anaphylaxis have food allergy. The appropriate evaluation of each of these diagnoses requires a series of tests and a thorough history and physical exam to develop a complete understanding of what is going on and why. For every two people I meet with life-threatening food allergy, I meet one person (family) who believes they (their child) actually are NOT allergic to foods. These families suffer significant stress for no reason at all. Many primary care physicians order RAST testing to evaluate for allergies, but they have not dealt with the range of results that can come back. RAST can be overly sensitive and often the results are false positives (This means that they are NOT clinically significant). Interpreting this requires other tests and a thorough history and physical exam. As well, many of these issues require extensive amounts of time to counsel patients and their families about why allergies/asthma happen, how to manage them, and what the future holds. In our clinic we spend almost two hours with our new patients to be sure we have time to cover these issues. In truth, a primary care office does not have the time in their schedule to focus on these issues in such detail. If they do, then other aspects of primary care will fall short. The primary care doctors’ job is extremely challenging. They must assess and treat vaccination records, school issues, concentration issues, social stressors and challenges, and many, many other things. The good allergist forms a team with the primary care physician to allow a patient and their family a chance to focus on one or two of these concerns in significant detail. What types of allergy tests are available? Skin prick testing involves pricking the skin just slightly and then adding a drop of the serum inside the scratch. A patient must remain still for 15-20 minutes to allow any reaction to occur. The skin prick test can determine allergies for specific foods, such as peanuts, tree nuts, eggs, and dairy. It can also specify an allergy to multiple variations of grasses, trees and weeds. If your child is likely to be receiving allergy shots for environmental allergies, a skin prick test will determine EXACTLY what they are allergic to in order to create the allergy shot serum. A -0- on the test means no allergy is present, while a 4 is a severe allergy. Should your child begin to hive severely, the test may be stopped mid-way in order to administer Benedryl® and to wipe off the serum. That would definitely indicate a severe allergy! There is also a blood test referred to as a RAST (Allergen-specific IgE antibody test). This test is less invasive, as blood is drawn once and is then sent off to a lab. The results of the RAST test are given in similar form to the skin prick testing. The RAST scoring goes from a Class 0 which is a negative result to a Class VI, which is as high as it goes. Class I and beyond show increasing levels of Specific IgE Antibody. There is another type of allergy blood test called an Immunocap RAST. The Immunocap is a type of RAST test that utilizes Pharmacia equipment. This is a specific type of RAST test. Dr. Hugh Sampson, one of the foremost food allergy researchers, has developed positive predictive values and negative predictive values for this test. In other words, he found that a score of 14 is a positive predictive value for peanuts, and thus likely to indicate a reaction. The negative predictive value is a score of less than 0.35 for peanuts. At this level, a child has an 85% probability of not having a reaction. There are positive and negative predictive values for egg, milk, peanut, fish, soy and wheat at this time. With more research, more foods will certainly be added over time. I have had experience with a doctor telling me that there is no way my daughter could have allergies since she was only 2 years old. His way of thinking was that it takes years for a child to be repeatedly exposed to an allergen before they develop an allergy. I have found that this isn’t true. 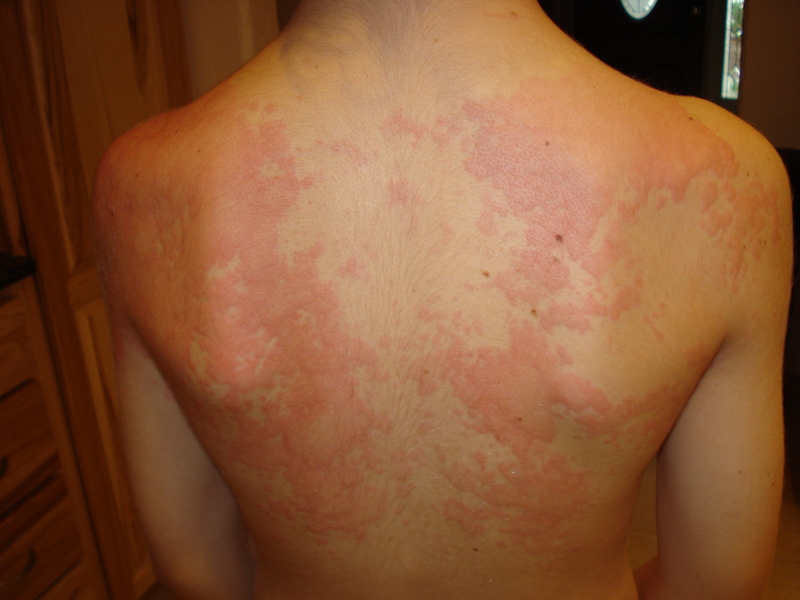 My son’s first exposure to peanuts at 9 months old, by just touching peanut butter, brought on severe hives. What do allergic reactions look and act like? Each allergic reaction is different. My daughter’s reaction to Ceclor antibiotic took 7 days before it blossomed. She took the medicine as prescribed for 7 days, and upon waking one morning, she looked like a swollen red balloon. Her eyes were swelled shut, and I commented that she looked as if an alien had inhabited her body during the night! My son’s reactions to food are almost instant. He has gotten hives within 5 minutes of eating an egg product, for example. His exposure to peanuts has been by touching them, and one time accidentally ingesting a product that stated ‘May contain peanuts.’ Both of these exposures created reactions immediately. Our allergist has told us that most IgE allergic reactions to foods will occur within minutes up to about 2 hours after ingesting the offending food. It is certainly possible to have other types of reactions to foods than IgE reactions, such as a gluten-intolerant person would react to wheat. This isn’t an IgE mediated reaction, however. Should your child have hives or severe allergic reactions that neither you nor your doctor can determine their cause, my suggestion is to begin a diary of food’s eaten. In some children, the reaction takes hours to occur. This makes it difficult if not impossible to determine the offending allergen. If you’re just beginning to add new foods to your child’s diet, you may want to delay the introduction to one new food per week. This ensures that you can track any reaction that may occur. Some children have repeated ear infections, another sign of allergies. The mucus builds up in the child’s system and overloads the Eustachian tubes, which get infected. 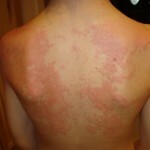 My son has also had hives reactions to pillows, grass, dandelions, stuffed animals . . . the list goes on forever! Tracking down the source of a reaction requires good detective work. Monitoring his eyes has been especially fruitful for us. He seems to always begin with itchy, red eyes. The key is to keep the reaction to a minimum and to have Benadryl® and his EpiPen® with him at all times. 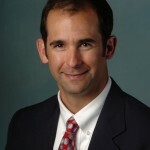 Once again, I asked Dr. Daniel Soteres to explain another allergy phenomenon: Oral Allergy Syndrome. Can you please explain what Oral Allergy Syndrome is? It is my favorite food allergy issue. It is so elusive. The bottom line is that some pollens and foods have cross-reactive proteins. For example, up to 50% of people with Ragweed allergy don’t like the taste of bananas. In general they say “I don’t like the texture.” or “It makes my lips tingle.” Most people with this do not even report it when taking a history… you have to ask. Because the shared proteins are so unstable these people can eat banana pudding, banana bread, and even banana in fruit salad. A few of these people like bananas. However, if they eat one that is closer to green they get the tingling; if the banana ages a few days (almost banana bread) then they can enjoy it. There are other cross reactions. Birch tree pollen cross reacts with peach, carrot, celery, apple and a few others. Mugwort pollen cross reacts with celery, apple, peanut, and kiwi. The skin test is often negative. Why? Well, the skin test antigens for foods are stable enough to maintain the major allergic proteins, but OAS is due to less stable proteins. So, often the process of creating the antigen destroys the shared proteins. Depending on the patient’s level of concern (or curiosity) I ask them to set up a return appointment, take a lap at their favorite grocery and grab one of everything they think they are allergic to. At the appointment we do “prick to prick” testing (prick the fruit then the patient). We also prick the peel separately from the pulp of fruit because the highest concentration of cross reactive proteins is usually in the peel. Should children with OAS be prescribed an epinephrine device? The newest info about OAS comes from a review that suggested prescribing injectable epinephrine to those with OAS. This is a new recommendation. At our office we are prescribing injectable epinephrine for OAS on a case by case basis. The medical literature has no reports of anaphylaxis due to oral allergy syndrome. I have heard anecdotal reports. Some say that immunotherapy for the pollen (i.e. ragweed) can decrease the symptoms of OAS… hearsay and no reliable medical evidence to support this. OAS and concerns about anaphylaxis make sense. However, it has not been reported in the medical literature (this does not mean that it has never happened). There is a separate entity called Food Dependent Exercise Induced Anaphylaxis. This requires two triggers to stimulate the anaphylactic reaction. This is a life threatening form of physical allergy brought on by exercise plus another stimulus (food, medications, or alcohol). Triggers of Food Dependent Exercise Induced Anaphylaxis are: food ingestion within 4-6 hours of exercise, warm or cold temperatures, high humidity, drug ingestion within 4-6 hours of exercise (aspirin, non-steroidal anti-inflammatories (i.e. Ibuprofen, Motrin, Aleve, etc), menstrual cycle, and seasonal allergies. The foods associated with this are grains like wheat and barley; shellfish; nuts; fruits – apples, strawberries, grapes, peaches; garlic, parsley, basil, onions; Vegetables – celery, cabbage, tomatoes; milk, cheese; alcohol; foods contaminants like dust mites. Have you ever known a child with OAS to experience anaphylaxis? No. But I have contact with an older patient who knew for years that she could not eat peach peel. She loved peach pulp. So her husband always peeled her peaches (sounds funny). One day on a hike she did not let him peel the peach and her usually symptoms of oral discomfort progressively worsened to a systemic reaction. She did not have Epinephrine and used Benadryl® while she hiked out. What foods cross react with what pollens? Mugwort cross-reacts with celery, apple, peanut and kiwi. A person with any of these allergies may experience OAS with any of the foods, none of these foods, or only one of the foods. Can infants have pollen allergies? Or do they generally come on around age 5 or 6? In general, infants don’t have allergy to pollen. Most of the time it takes two seasons of exposure to a seasonal allergen (tree, grass, or weed pollen) to become sensitized. Therefore, we start testing children for seasonal allergies at around age 3. What is the youngest age that you would suggest a child would benefit from allergy shots? 5 years old. This just came up at my office. We were contacted by a family who asked if we could give their 3 year old allergy shots. The allergy testing was done by another office (out of town) and that doctor’s advice was to start on allergy shots (immunotherapy). I advised them to wait until their child is 5 years old. Because there is a risk of anaphylaxis with immunotherapy we like kids to be at an age where they can discuss early, potentially dangerous signs of an impending reaction. Remember, anaphylaxis may start with a mild cough, throat congestion, excess mucous (like post-nasal drip), sneezing, diarrhea, nausea, and vomiting. There may be more typical signs like itchy hives and wheezing. Regardless, it is important that your child is a good communicator to help stop a reaction early. Can children with oral allergy syndrome benefit from allergy shots to pollen? This is always fun to consider. It makes sense, right? If the shared proteins between a fruit and a plant pollen are responsible for the symptoms of oral allergy syndrome, then shouldn’t an allergy shot help reduce the sensitivity to that protein? Unfortunately, there are no large studies performed with a double-blind placebo controlled model. There are some case studies that report a benefit of allergy shots for those with oral allergy syndrome. Again, the case studies are not double-blind, placebo controlled and should be considered anecdotal evidence.